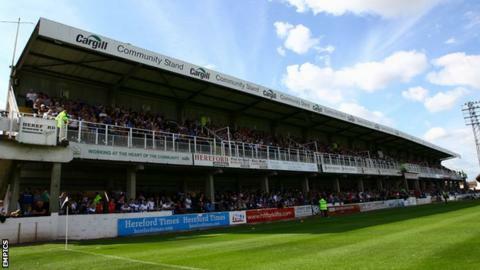 Hereford United have reported a loss for last year's 2011-12 relegation season of £422,472. At Monday's AGM, chairman David Keyte blamed a fall in FA Cup-generated prize money for a drop in income of £181,330. "The major factor was that, in the previous year, the club made £112,500 profit from cup run prize money that saw us end up at Sheffield Wednesday, but last year we made zero," he said. "In a year-on-year comparison, gate money was very similar," added Keyte. "But season ticket sales were 8.2% down. "The other significant change was that the previous year the figures included the sales of Mathieu Manset and Marc Pugh [£297,730]. "Last year, the only major transfer fee was Stuart Fleetwood, and some outstanding appearance-based payments from previous transfers [£91,915]. "The expenditure in the latest set of accounts includes the cost of the managerial changes, with the dismissal of Jamie Pitman and his management team." With still three nine months to go before this season's accounts are due, Keyte is already warning of a similar loss. The Bulls' relegation from the Football League to the Blue Square Bet Premier has already cost them an estimated £400,000. Added to that, the revenue earned by this season's run to the FA Cup second round - which brought TV revenue from the win over Shrewsbury and two games with Cheltenham - was used to pay off tax debts which, back in November, briefly threatened to force the club into administration. And Keyte warned just four weeks ago that the club are still losing £30,000 per month. "We have made cutbacks and far closer cost control," added Keyte. "But with the drop in Football League funding we face a similar loss. "These set of accounts highlight that a club at this level cannot compete without the bonus of cup runs and transfer of players. "Perhaps the only viable financial way back is the development of the ground, which we are actively working on, and the fact that the board are always open to new investment."